Uses: Containers, tubs, pots, borders and hard landscaping. Pruning: Tidy up dead foliage. Dryopteris filix-mas, also known as the Male Fern, is one of the most common ferns in Europe, and the the British Isles. Its a strong upright grower with light green lance shaped fronds and brownish scaled stems. 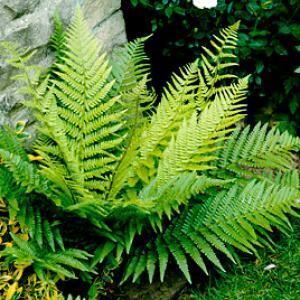 It is one of the most classic and useful ferns for the garden . Plant in any situation and in any good soil. Once established it will reach a height of 120cm x spread 100cm. Foliage is deciduous. Plants supplied are in 9cm pots.